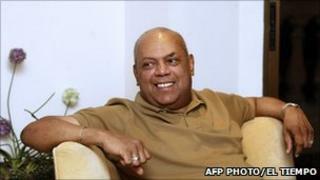 The Colombian salsa star, Joe Arroyo, has died at the age of 55, after being in hospital for a month with heart, lung and kidney problems. Arroyo, whose most famous hit was La Rebelion, began singing in brothels in the Caribbean city of Cartagena at the age of eight. He went on to sing for a number of Colombia's most famous salsa groups. But he also drew on a rich heritage of other Afro-Colombian rhythms during his career, and composed over 100 songs. His wife said Arroyo died "peacefully" in Barranquilla, another Colombian city on the Caribbean coast. "A great loss for music and for Colombia" was how one fan - the country's president, Juan Manuel Santos - described Arroyo's death on the social network, Twitter. The man born Alvaro Jose Arroyo Gonzalez had a colourful life, including problems with drugs, all of which provided material for his music. He rose to fame in the 1970s, singing in the band Fruko y Sus Tesos, before later setting up his own band, La Verdad - "The Truth". He was due to be awarded a lifetime achievement award at this year's Latin Grammy celebrations.